The vitola is a Mágicos (hence the name) with a length of 115mm and a ring gauge of 52. 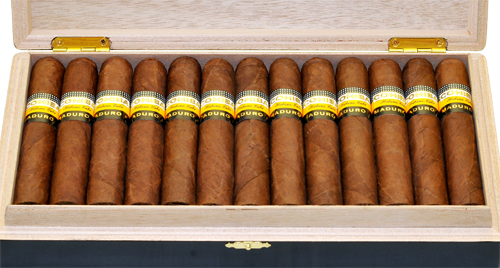 Some refer to the Mágicos size as a Robusto, but it really isn’t. A Robusto is normally 124mm in length and only has a ring gauge of 50. Think of the Partagás Serie D No.4 and the Bolivar Royal Coronas. The Mágicos is slightly shorter and has a thicker gauge compared to a Robusto. 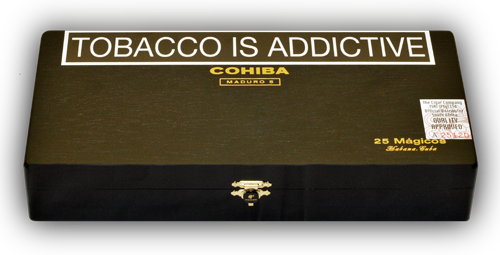 What makes this line of cigars from Cohiba so special is that the wrapper is aged for 5 years and it becomes darker with the special care of a natural fermentation process and only the top part of the tobacco plant's leaves is used for this wrapper. The box itself is not to be sniffed at either! It is a beautifully crafted cedar wood box finished in black. It is not the same black finish that you will find on the high gloss cigar boxes of the Behike line. The grain of the wood is still visible through the black paint, but it is no less impressive. The hinges and beautiful clip is both made from brass and on the clip is a black button with COHIBA and the female head logo printed in gold. When opening the box there is a wax paper insert that briefly explains what makes this cigar what it is as well as a paper-thin cedar wood layer with COHIBA and MADURO 5 printed on it. Below the cedar wood layer you find the Habanos s.a. quality guarantee insert and finally a larger piece of wax paper that covers the cigars. When removing this sheet of wax paper you are at last greeted by the top layer of 13 perfectly packed cigars. The sweet smell of chocolaty tobacco overwhelms one’s senses. The cigar’s construction is perfect with no hard or soft spots and nothing less is expected from a cigar of this caliber and price range. 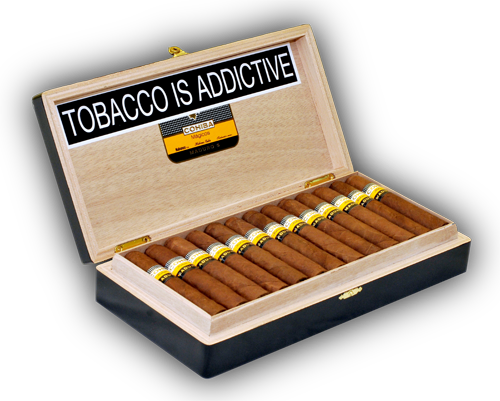 The dark wrapper is immediately noticeable and any Cohiba lover will see that this is not the standard golden coloured wrapper leaf that Cohiba is so well known for. Upon closer inspection the dark wrapper is a characteristic quality of this very fine cigar. The band not only resembles the standard Cohiba design but also includes an additional black design on the bottom end with MADURO 5 printed with gold foil. The MADURO 5 on the band is not embossed like COHIBA. I never read any other reviews about a cigar that I need to review before the time so I must admit that I have no idea what to expect when lighting up this cigar. I grab my cutter and when I cut away the top part of the otherwise perfect triple cap the chocolaty tobacco flavour is immediately present again. The cold draw reveals nothing but flavours of dry grass and hay. Some cigars require a few draws before any real identifiable tastes emerges, but that is not the case with this cigar. 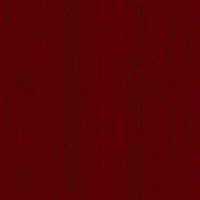 From the very first draw a delicious salty leather is present as well as dark smokey wood on the on the retrohale. Halfway into 1/3 slight hints of roasted coffee bean emerges on the back palate. Leather and smokey wood is still the dominant flavours. A woody aftertaste remains. At the end of 1/3 and approaching the beginning of 2/3 the roasted coffee bean mentioned earlier takes over and becomes the prevalent flavour that is noticeable. 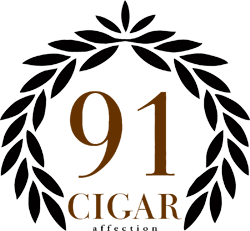 It must be noted that the roasted coffee bean is only present on the finish and lasts only for a couple of seconds after which the woody aftertaste returns. A bit further into 2/3 the salty leather returns. At this stage the strength also takes a step up the ladder and after another couple of draws the smoke becomes toasty with a subtle and maybe even elusive hint of distant spice. Going on the cigar keeps on producing toasty tobacco flavours and smokey wood with the short bursts of roasted coffee bean on the finish ever present. Halfway into 2/3 the salty leather makes another appearance while the aroma of sweet tobacco hangs in the air. This is one cigar that you can nearly enjoy as much smelling it as smoking it. 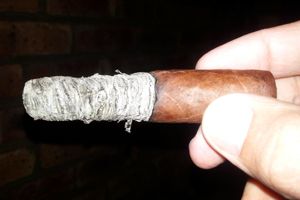 So far, just over the halfway mark the ash is still rock solid and this is testimony to how well this cigar is rolled. Approaching the end of 2/3 leather and roasted coffee bean is now the predominant flavour profile. The aftertaste is still woody, but less smokey. Into 3/3 spice emerges more strongly with toasty tobacco and woody flavours now taking over. The roasted coffee bean is still present on the short finish and the strength increases again. Spice emerges - dare I say BBQ spice... The flavours and leather and roasted coffee bean have now completely subsided. Well into 3/3 and the flavours that are present now are that of earthy tobacco. A slight woody flavour is present on the finish. 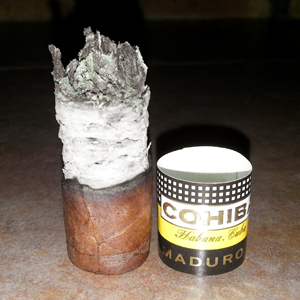 There is a lot of strength and a generous amount of smoke that comes from the Mágicos in 3/3. The cigar ends graciously with earthy tones and an ever so gentle woody aftertaste. In Conclusion - Don’t let the short size fool you - it took me 1hour and 7minutes to smoke this cigar. This is a superb smoke if you are looking for a medium to full-bodied cigar with a generous amount of complexity that is not overpowering. Leather, coffee, wood combined with smokey and toasty flavours is what you can expect. Despite the strength as well as the toasty and smokey nuances the Mágicos is not a dry cigar. The wrapper’s ash is a very light gray and the filler is a darker charcoal gray. The ash broke off just over the halfway mark for the first time and there was no need to ash again as you can see on the picture below. The burn was not 100% perfect but did not require any correction throughout. An ideal match for this cigar will be a glass of Hermanuspietersfontein’s Kleinboet 2008. This wine is a Bordeaux style blend that will greatly compliment the Cohiba Maduro 5 Mágicos. This is a highly recommendable smoke if you enjoy a stronger and more complex cigar. I would personally not recommend this cigar for beginners since the strength and complexity might overwhelm a new cigar enthusiast. This cigar is Humidor Premium Select quality for sure! Review weather notes: Evening, 20°C with passing clouds and no wind.